omid (mashhad, Iran) on 27 March 2017 in Abstract & Conceptual and Portfolio. What a beautiful orange theme! Very particular, I like it! This is wonderful, this sunset ! Espectacular composición, con maravillosos tonos y luz. ***** Buenos días. Magnifique reflet d'un ciel somptueux ! An exceptionally fine image even by your elite standards. Totally ***** superb. amazingimage and reflecions here !!!!! Au soir, les couleurs chaudes du couchant dans l'eau et les herbes forment un beau tableau ! Another of your 'unerarthly' images ... this warm colour has become your trademark!!! J'adore les couleurs chaudes,bien vue! A wonderful capture of these reflected colors. The result is a silhouetted picture of details. An excellent shot. Gorgeous colors, textures and reflections captured here!! Amazing reflections here!!! Stunning landscape! Stunning. Wonderful colours and reflections. Excellent capture. I sure like that great colour. Fantastique rendu et doré et ce plantes sueprbe image. Fire and water make a beautiful abstract composition! Magnificent colours! This is a great collection of colours and a stunning image : bravo ! Strong and beautiful colors reflected in the grassy water. 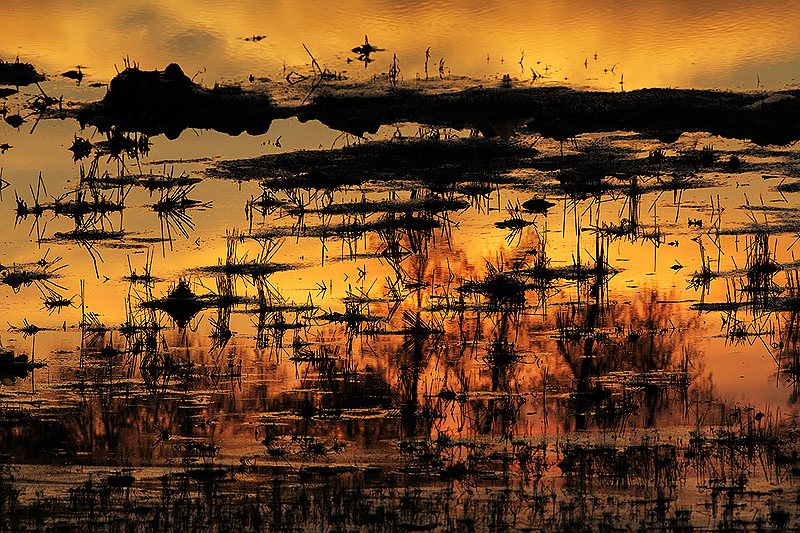 Beautiful mix of silhouettes, warm colors and reflections.